After returning from Bishkek, I spent a few weeks in Almaty before heading out on another two-week journey. As a Fulbright scholar, I have the privilege and opportunity to visit "American Corners" in different cities, give lectures and interact with local students. So the past two weeks I spent traveling on an "American Corners Lecture Circuit," of sorts, to Karaganda, Semey (formerly Semipalatinsk) and Ust-Kamenogorsk (also called Oskemen). See map below. I was excited to see the northern parts of the country, which was historically more "Russianized" than the south. I would advise future travelers, however, to not go in the winter. The consistently low temperatures of -20 to -40 celsius, combined with the violent steppe winds, makes walking outdoors for more than ten minutes virtually impossible. The cold penetrates your bones. It is really quite brutal. But I can't complain about the cold, because I had the opportunity to meet some fabulous people on the train and in my travels! First, in Karaganda, I was fortunate to stay with the retired parents of my friend who lives in Almaty. I was so excited to spend three days with local pensioners. From my previous home stays, I find that pensioners are so fun, fascinating and engaging -- they are living history books. 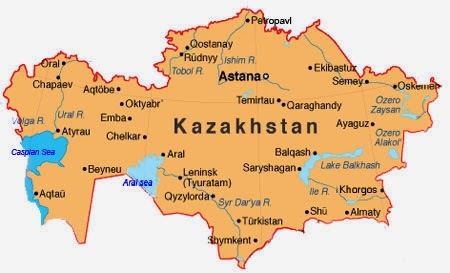 The apa (Kazakh for "mother") was originally from Aktube and moved to Karaganda when she enrolled in university while the ata (Kazakh for "father") was born and raised in Karaganda. Interestingly, he came from a wealthy Kazakh family. During Stalin's reign, his father was labeled an enemy of the state, imprisoned and sent off to a labor camp. Listening to apa and ata's stories on life in Karaganda during the early Soviet period, and later on, was so insightful and humbling. They told me about the famine of the Kazakh people int he 1920s and during STalin's time, as well as the Karlag. Karaganda was the home to the Karlag, one of the Gulag labor camps. Many Jews, Armenians, Chechens, Tatars, Kazakhs and other intellectuals, including Dostoyevsky, were sent to the Karlag. After Karlag closed, Karaganda inherited a diverse, yet talented workforce. The head of the Medical Institute was a Russian Jew. In fact, during the Soviet Union, Karaganda's Medical Institute was so well respected that you could graduate from there and be directly placed in an institute in Israel. Karaganda also had a leather and coat factory, as well as metalworks. While Russian was naturally the lingua franca, there were three Kazakh language schools, according to apa and ata. Today, it remains an industry town, albeit changed greatly by the breakup. They also told me about how people got along during the USSR -- they would leave their shoes near the front doorstep to the building. Because everyone had the same goods, no one stole things. Yet after the breakup, when different gangs emerged, so did theft. But good-neighborliness did not! People would line up with their pots and collect soup for their families in the aftermath of collapse, when supply chains failed to function. I must say a big thank you Apa, Ata and my friend for their gracious, Kazakh hospitality, and for sharing their oral histories with me. I feel so humbled and honored. After Karaganda, I took the train to Semey. 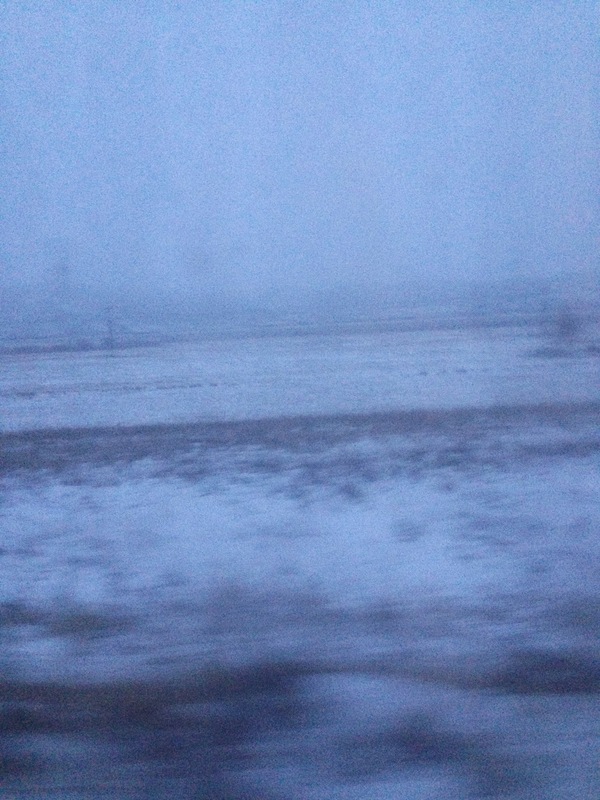 It would have taken 9 hours to cab, but given the uncertain winter road conditions, I opted for the 28-hour train ride. It turns out this was a "commuter" train in that it stopped at mining and industrial towns peppered along the steppe. Many people on the train -- all of three wagons -- worked in Kazakhmys or other mining companies. They were going for their 15 or 20-day rotations in the field, before returning home for 15 or 10 days of rest (they call it a 15/15 or 20/10 schedule). While I expected a barren, snow-covered steppe, I was surprised by the worn-down, Soviet, and half-built buildings I saw along the route. 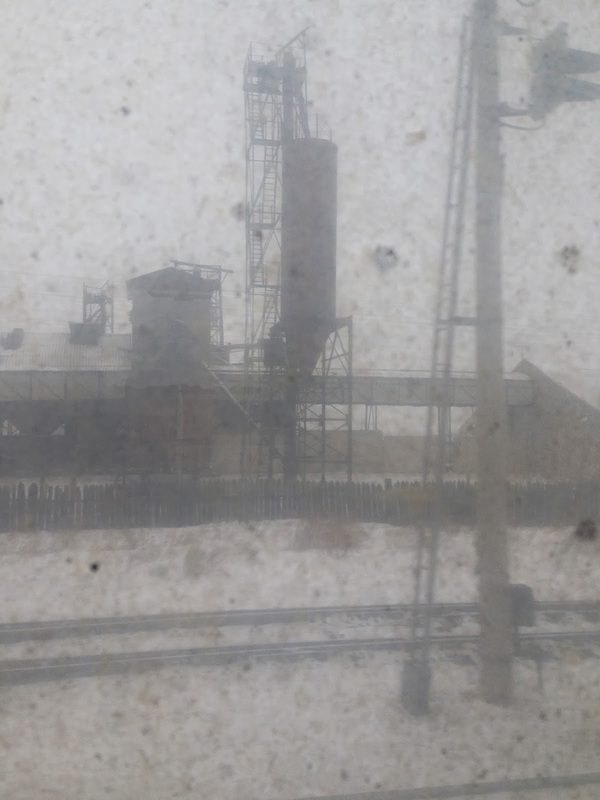 Northern Kazakhstan historically received a lot of Soviet investment, but it appears, at least from the train, that the infrastructure was not maintained. Many towns were either deserted or not given adequate funds. With that said, my train ride was quite lovely. I shared the cabin with a lead engineer, miner, and a local businesswoman who owns two stores in Karaganda. She imports European and Chinese clothes, so it was interesting to talk about trade in Kazakhstan. We had a "traditional" train experience where everyone shares their food and socializes. As the token American on almost every train I've taken here, I always have the same conversation for the first twenty minutes. They ask why I'm here, where I learned Russian, etc. But beyond that, it was interesting to hear their personal and professional anecdotes. 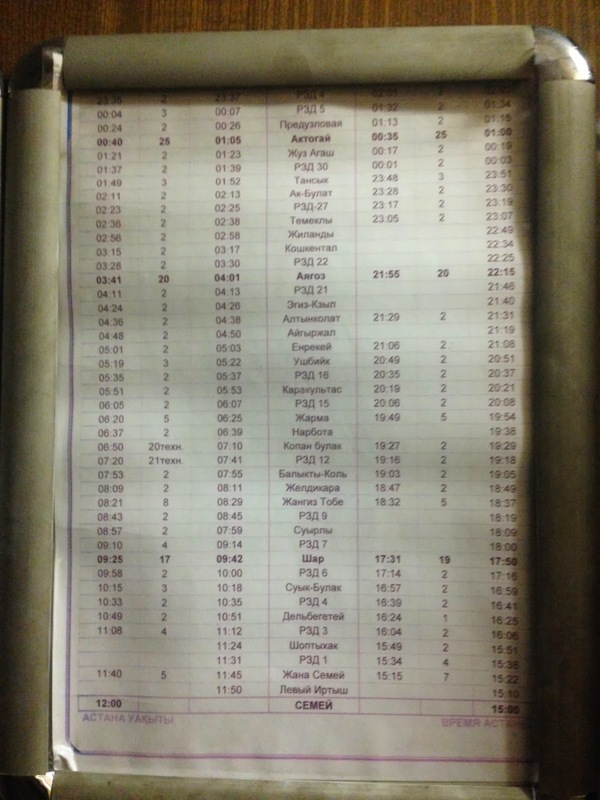 The list of stops on the "commuter train" between Karaganda and Semey. Semey was bitter cold, but I enjoyed the city. I unfortunately did not get to go to Kurchatov, but managed to visit some of the monuments to the victims of nuclear testing. 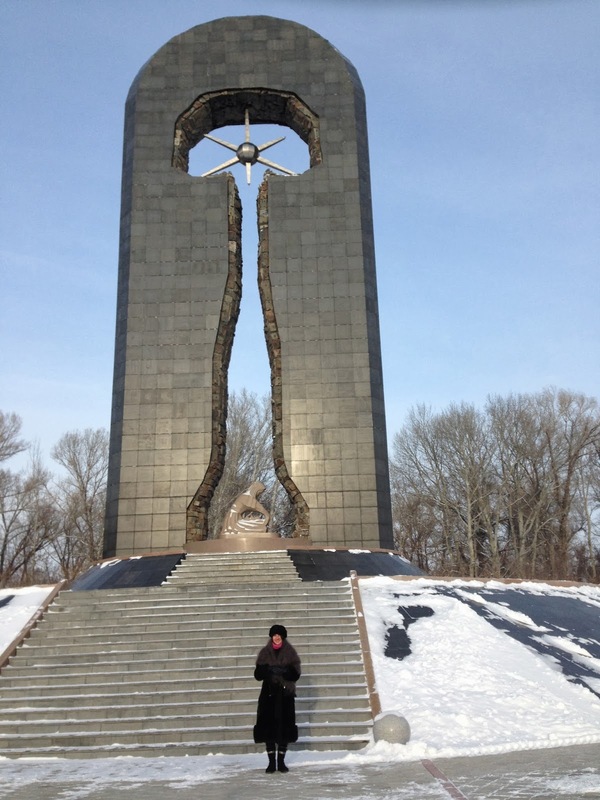 In -20 C at a memorial for victims of nuclear testing in Semey. 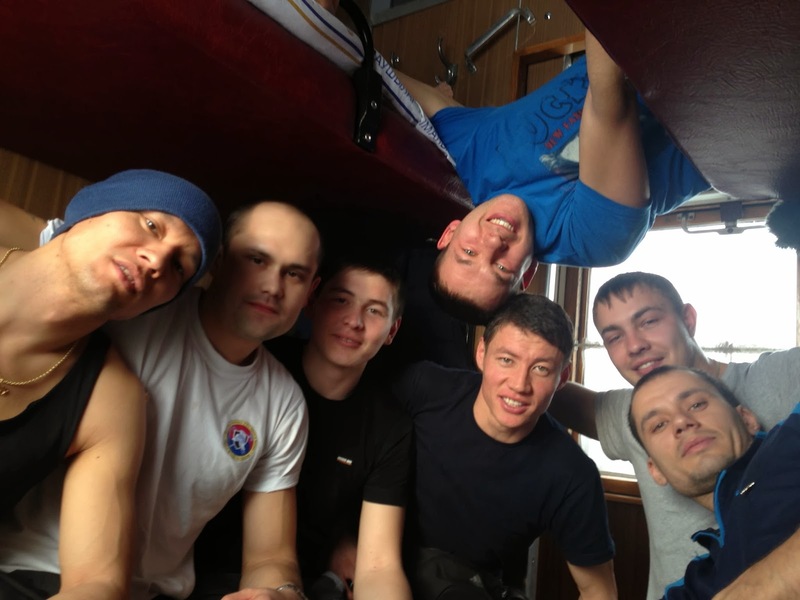 On my train from Semey to Ust-Kamenogorsk, I had the pleasure of meeting the national team for "Fire Sport." I sat down on the train at 7:30 AM, which was coming from Astana, and already had two people in the cabin -- the coach and one of the athletes. When one of the athletes woke up, we chatted. A few hours later, we were joined by the entire team. Now, isn't this every girl's dream -- a train cabin filled of perfectly-toned, athletic fireman? Haha, but really. The National "Fire Sport" Team of Kazakhstan. A quick train picture! This one taken while approaching the Russian border! The Semey - Ust-Kamenogorsk train follows the old Soviet route and goes through Russia, so we had to stop and the border leaving and re-entering Kazakhstan for passport checks and so dogs could sniff for narcotics. 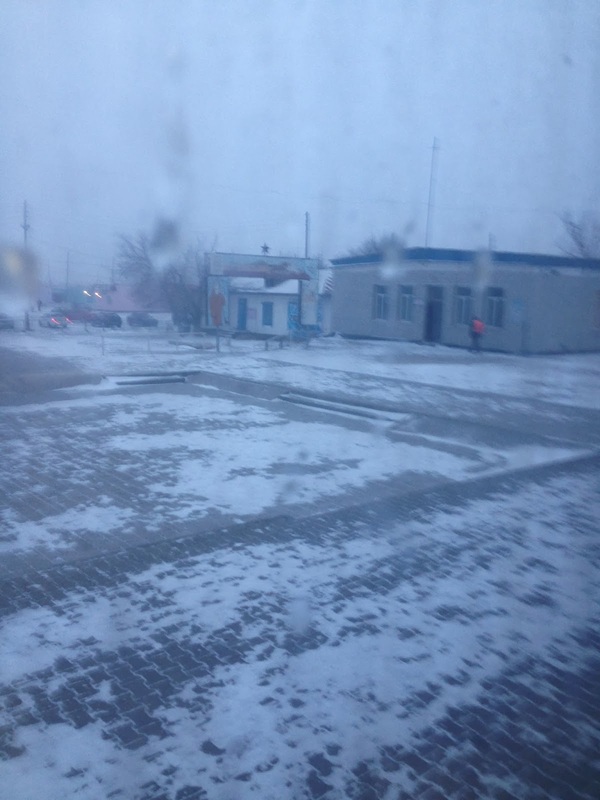 A scene of Karaganda. Notice how the streets are empty. It is so cold. In Ust-Kamenogorsk, I was excited to see my buddy and fellow Fulbrighter, who is a biologist researching snow leopards. I was also impressed with the Pushkin Library, which is the only one in Kazakhstan with an open-stacks, self-check out system!!! I've spent a lot of time in Soviet, closed-stack libraries with no electronic catalogues, so this was so, so impressive! Well done, Pushkin Library! I also spent some time to visit some of the more industrial areas of town (see photo below). The Ulba Metallurgical Complex!!!! I paid a taxi to drive around the complex just so I could see it. I spent basically all of my senior year researching the denuclearization of Kazakhstan, particularly Project Sapphire. In 1994, Project Sapphire was a top-secret operation to remove 600 kilograms of Highly Enriched Uranium (HEU) from the Ulba facility to Oak Ridge, Tennessee. While I was not able to get into the facility, which continues to process uranium and produce pellets for Russian enrichment facilities, just seeing it was a thrill. 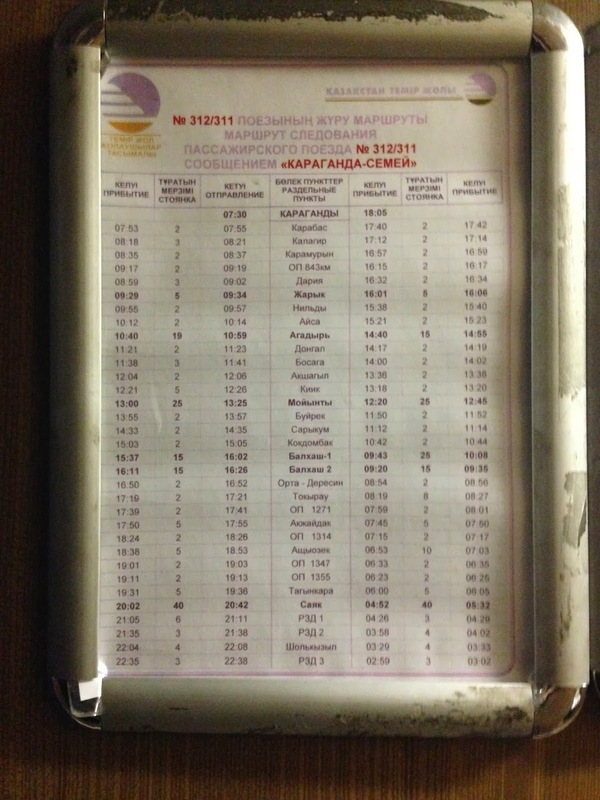 Alas, the Siberian journey ended with a 28 hour trip on the train from Ust to Almaty. I slept, but had a lovely chat with a hairdresser, hockey player and college student, in my cabin. As I write this, I am preparing to leave for Shymkent -- the last city on the lecture circuit. I'm so excited to go to Shymkent, a very traditional Kazakh city that some call "the Texas of Kazakhstan." Either way, it is in the south and is "warm" (weather looks to be around 15 F). i'll share your post with my parents.